My answer is typically Costa Rica. This peaceful country in Central America has such a variety of activities, experiences, and nature that the most difficult task is narrowing down the choices to just the right mix for each family. From Pacific Coast to Caribbean Sea, with mountains, volcanoes, cloud forests, and wetlands in between, Costa Rica (meaning “rich coast”) is one of the world’s most biodiverse and ecologically conscious countries. The last time you were at the zoo, did you notice which animal absolutely delighted your children? Monkeys are a kid-pleaser, and even more so in the wild. Costa Rica’s four species of monkeys provide endless entertainment as they are easily seen on nature walks and around the grounds of your hotel or villa. White-faced or capuchin monkeys are the most friendly, willing to eat banana pieces out of your hands and eager to steal the lunch from your table (whether or not you consider that a good thing). Howler monkeys, the largest of the four, are the loudest creatures in the jungle – their early-morning growling may be your wakeup call! Spider monkeys are a delight when discovered high in the trees in large colonies, swinging from their prehensile (weight-bearing) tails. Squirrel monkeys, the smallest of the four, are endangered, and are a prized sighting when hiking in the national parks. But monkeys are just one of Costa Rica’s 200-plus intriguing mammal species. I recommend getting to know the 3- and 4-toed sloths, which offer many opportunities for jovial comparison to fellow family members. Other unique creatures include jaguars, tapirs, anteaters, and the nocturnal and fun-to-say kinkajou, a bit of a cross between a monkey and a raccoon. Guided nature walks in the many preserves and parks offer a chance to learn more about these creatures and how to spot them, thanks to the help of an experienced local. More than 600 species of birds reside in Costa Rica, including fifty species of hummingbirds. Avid bird watchers know it’s one of the best locations in the world for birding tours. Either in the wild, on nature walks, or in the reserves, children will love seeing the colorful scarlet macaws, quetzels, and toucans. If you’re a fan of butterfly gardens, prepare to be wowed! Costa Rica boasts 10 percent of the world’s known species of butterflies. A favorite, mesmerizing visitors with its float-and-fall flight pattern and iridescent blue wings, is the large blue morpho with a wingspan of five to eight inches. A popular place to see them and other butterflies up close is La Paz Waterfall Garden’s butterfly conservatory, a laboratory and breeding ground for over twenty-five species of butterflies. Here, visitors are surrounded by more than 4,000 butterflies fluttering about. Wildlife sanctuaries located throughout the country provide an opportunity for up-close encounters with the native wildlife and La Paz Waterfall Gardens is one of my favorites. 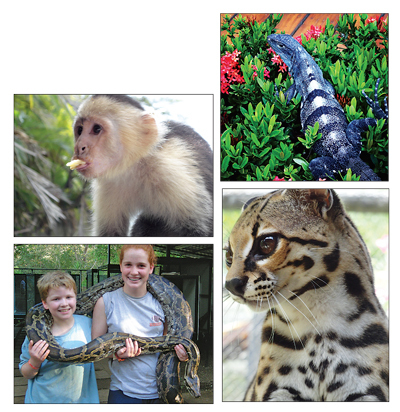 In addition to the butterfly conservatory, nature lovers will find a snake and reptile aquarium, a frog house, aviary, a successful cat rescue, hummingbird garden, plus wild sloths and monkeys along the trails to the waterfalls. Manuel Antonio Nature Park and Wildlife Reserve offers a unique night walk and guides use flashlights to showcase the nocturnal creatures as they call back and forth with the frogs. At the wildlife preserve at The Springs Resort overlooking Arenal Volcano, you’ll have the chance to feed a toucan or pet the paw of a rescued wild cat. In the 1970s, the Costa Rican government took action to preserve and replenish the country’s diminishing natural beauty, creating today what is one of the world’s most prosperous ecotourism industries. A world leader in preservation of natural habitat and rainforest, Costa Rica now protects thirty-two national parks (25 percent of the country’s landmass), fifty-one wildlife refuges, thirteen forest reserves, and eight biological reserves, many of which are used for science and research purposes as well as the protection of endemic and near-extinct wildlife. My national park picks for family visitors include Tortuguero, located on the beautiful north Caribbean coast and a significant nesting area for the endangered green turtle; Corcovado in the remote Osa Peninsula on the southern Pacific coast, considered among the most biologically intense places on earth; Manuel Antonio, the most popular park due to its central location, plentiful and diverse wildlife, and natural beauty including some of the country’s best beaches; and Arenal, with Costa Rica’s most active volcano and a great draw during its most recent eruption, which ended in 2010 but is expected to erupt again soon. Zip-lining adventures are very popular and take thrill seekers into the canopy and emergent layers of the jungle that your kids likely learned about in science class. 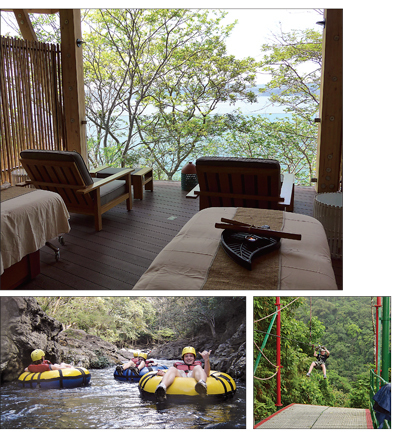 Safely speed along the treetops for up-close and bird’s-eye views of the dense, green surroundings. Jungle and forest hikes featuring hanging bridges are a more tame option for the younger, or older, or less-adventuresome family members. Families with kids who have enjoyed summer adventure camps will want to plan a canyoneering tour that features rock-climbing and rappelling in canyons and over waterfalls. If your family enjoys hiking, or just walking in the woods, you will find many safe and well-marked trails and guided hikes that will allow you to experience the variety of landscapes, views, wildlife, and volcano tops. Some top trails include hiking around Arenal Volcano with old lava flows to traverse in primary rainforest; the Rio Celeste waterfall and Tenorio Volcano Hike, featuring a blue river that must be seen to be believed, hot springs, and furnace vents; Manuel Antonio Park for spotting wildlife; Bajos del Toro Waterfall hike in the cloud forest; and Poas Volcano hike with direct access to one of the deepest and most active craters in the world! Costa Rica, with miles and miles of Pacific and Caribbean coastline, has more than 300 beaches in a variety of natural settings. You’ll see white sand beaches with bright blue water, but I also love the ones that are rocky or gray or brown, and quite naturally beautiful, with rocks, tide pools, mangrove trees, and driftwood decorating the view. There are lovely calm-water beaches for family swimming and others renowned for excellent surfing breaks. The village of Tamarindo is a great destination for families for its pretty beach with gentle waves, offering an easy place to learn to surf, with several surfing schools in the area. Nearby Playa Avellana, locally known as Little Hawaii, has excellent surfing conditions year-round, with waves up to eighteen feet, and features the eclectic surfer’s haven and low-key beach bar, Lola’s, with views of the action. If you’re into sport fishing (or want to be), Costa Rica is home to many full-service marinas and easy-access deep water. Top catches include blue marlin and sailfish in the Pacific and giant tarpon in the Caribbean. In addition, you can fish for machaca and rainbow bass on inland lakes, or spend a day fresh water fly-fishing on jungle rivers. For more adventure on the water, experienced and novice kayakers will find many places to kayak, looking for wildlife and enjoying the surrounding natural settings. Countless lakes, rivers, and estuaries, plus the coastal waters, provide opportunities for a host of activities to combine with kayaking as well, such as standup paddle boarding, snorkeling, and sailing. Looking for something a little more up-tempo than a kayaking trip? White-water rafting and tubing is heart-pumping fun in Costa Rica, with a landscape filled with fast-flowing rivers carving through canyons and valleys surrounded by dense forest and scenic waterfalls. Calmer rides are also an option, with a chance to just float along enjoying the surroundings and spotting wildlife. Costa Rica’s six active volcanoes create rich geothermal environments, providing many places to enjoy natural hot springs and mud baths in the surrounding areas. A good spot is around the Arenal Volcano, where several hotels are built around the hot springs, and offer swim-up bars with tropical cocktails and water slides. From the beachfront resorts, there are many day-trip options to enjoy the warm waters and natural mud and mineral baths, with companion adventure activities on site. While coffee has taken over as a top export, cocoa production is making a comeback, and farm tours provide an insight into the history and growing methods, and feature tastings of every phase of the production process, from the raw cacao fruit to the freshly toasted beans, to the finished product. Cultivated and cherished as the food of the gods in pre-Columbian times, Costa Rica’s locally produced chocolate is excellent, and kids and parents alike enjoy learning about its origin in the cacao plant on a chocolate tasting tour. Even the most experienced and skilled mountain bikers will find challenging opportunities to experience Pura Vida on two wheels, as yet another adventure activity grows in popularity in Costa Rica. A new resort, Rio Perdido, has an MTB circuit that attracts the pros, but provides options for casual riders as well. If you’re not on a time-trial, you can stop along the trails to enjoy the resort’s panoramic lookouts, waterfalls, and caves, and finish at the hot springs. Professional guides and bikes are provided. 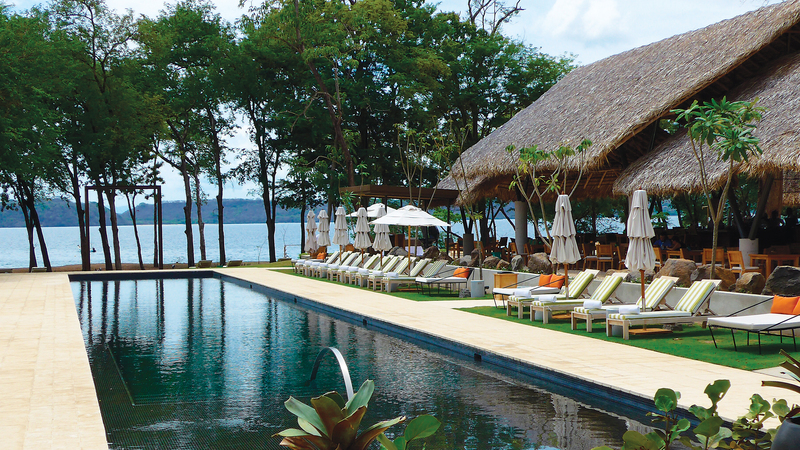 Whatever your hotel preference or budget, you’ll be able to find what you like in Costa Rica. From locally owned inns and boutique hotels to full service beachfront resorts, lodging is designed with families in mind with multi-bedroom suites and oversized rooms for easy sharing. Choose from 5-star luxury hotels with names you’ll recognize like Fours Seasons, Dreams, JW Marriott, and Westin, or find locally themed hotels like The Springs Resort at Arenal Volcano, featuring eighteen hot springs fed from the geothermal heated waters, an animal preserve, rock-climbing and river tubing. The Peace Lodge, adjacent to the La Paz Waterfall Gardens, is another option. Costa Rica is also known for its eco-lodges. One of my favorites is the luxurious Pacuare Jungle Lodge, located deep in a lush rainforest on one of National Geographic’s Top Ten Scenic Rivers. Lit only by candle and lantern light (there is no electricity) the lodge offers lots of adventure, including arrival via raft on class III and IV rapids, monstrous zip lines and rappelling, waterfall hikes, and dinner in the treetops, plus outstanding farm-fresh meals and creature comforts like plunge pools and spa treatments. Because dining choices are part of every family vacation, you should feel good about feeding the family with lots of fresh local fruits and vegetables, chicken, fresh fish, roasted pork, and lots of black beans and rice (served mild), the staple of all Costa Rican meals. Enjoy discovering plantains, starfruit, papaya, soursop, coconuts, fresh salsas, and the popular national condiment, Salsa Lizano, which is likely to come home with you as one of your souvenirs. Costa Rica is a peaceful, welcoming country with no army, one of the world’s highest literacy rates, and a focus on family. The country is well-organized for tourism and very accommodating to visitors. Most of the locals you will encounter speak English well, and are honest, friendly, and excited to share their beautiful country with you. You can relax and let your guard down here. 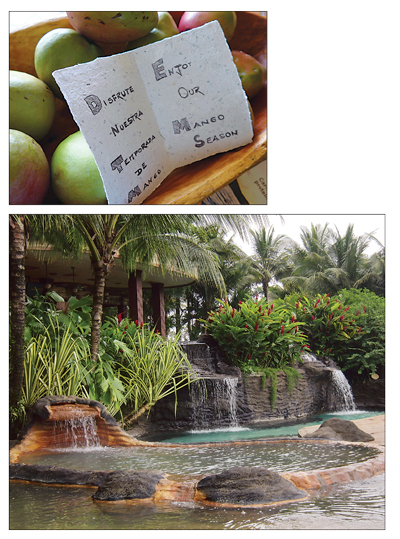 Best times to visit: November through April is the high season in Costa Rica with the driest and mildest weather. Summer is the “green season” with regular, but brief afternoon showers, and more heat and humidity. Flights: Connect easily from Richmond to non-stop fights from Charlotte, Atlanta, or Baltimore to Costa Rica’s two international airports: Liberia and San Jose. The international flight is three to four hours from the hub airport. School trips: As a safe destination with interesting culture, Spanish language, and real-life science in spades, Costa Rica is a top choice for school group trips, and you may find this to be a great way for your older kids to go. Planning your trip: A one-week trip is best split between two locations; typically first-timers will fly to centrally-located San Jose, tour the Arenal area for adventure activities, then fly or hire a car to reach the coast for some beach time, and fly home from nearby Liberia. A 10-day trip allows for time to include a third destination. With long travel distances between highlighted spots, often on curvy mountain and dirt roads, it’s best to stay put in each place a few nights.